Lunea Weatherstone’s new book for Llewellyn is Tending Brigid’s Flame. The book is a consideration of the stories and power if the Irish saint and goddess. Through mythology and personal anecdotes, she acquaints the reader and re-acquaints the devotee with the ancient flame, artisan, and poet/writer goddess. Weatherstone also offered personal testimonies from her own experience and from other devotees, musicians, craftswomen, writers, poets, and flame keepers both pagan and not — but all devoted to Brigid, all of whom share their stories which resonate with love for Her in very personal and touching levels. There are also suggestions on devotions and meditations to Her if one needs a little hand getting to know Her. I have been very fond of Brigid and devoted to Her for quite a long time and I still found stories about Her here that I had never run across, as well as fresh new ideas to add to my practices. I was also pleased to find very little of the fluff one might fear in such a tome, which I found very refreshing. If I had one criticism of the book it was just a personal thing: I kept thinking she misspelled Brigid, as I usually spell it with the “h” (Brighid) and had to check myself there. 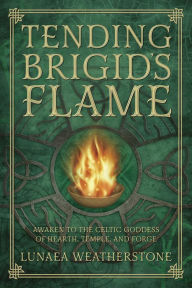 But all in all, I found Tending Brigid’s Flame a worthy little book for the goddess and saint and full of hints and pleasing stories for her devotees and those who want to be. If you know and love Brigid, I think you will enjoy this offering; if you do not know Brigid, you will find enough here in Tending Brigid’s Flame to pique your interest.